Il clienti valgono piú del brand? 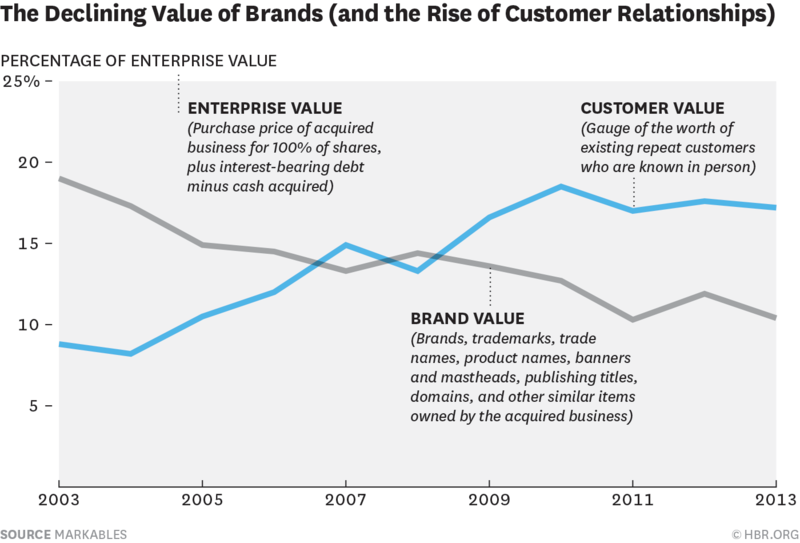 The value of “brand” is declining. The value of “customer relationships” is increasing. To find out which school of thought is more accurate, we looked at the value of brands and customer relationships as revealed by M&A data covering over 6,000 mergers and acquisitions worldwide between 2003 and 2013. The beauty of M&A for examining valuation trends is that M&As reveal the dollar valuations of all assets at the time of the acquisition. Upon acquiring a business, companies have to value the different assets they acquired for their accounts and balance sheet in accordance with accounting and reporting standards. These valuations include – among other assets – brands (trademarks) and customer relationships. This graph, based on data from the MARKABLES database, represents brand and customer relationship valuations as a percent of total enterprise value. The percentages come from fair value assessments done by purchase price allocation experts according to established accounting standards. This seems like as good an idea as any other, because you’re basing everything off the idea of mergers and acquisitions. A ton of small companies — who probably come in focusing on “brand” and “customer” a lot — ultimately want to get bought, so the logic here is fairly sound. So now go back to the chart, right? The value of brand/trademark/etc. has basically been halved, and the value of customer relationships has essentially doubled across the last decade. Things are clearly headed in very different directions here. There’s a “sky is falling” situation which people might want to draw here, and that would be dumb. The concept of branding isn’t going anywhere. There will always be brands, trademarks, brand standards, and marketing execs will always talk about “the brand” as if it’s a newborn child. It’s not like, going to disappear. What this all does mean, though, is that the funnel has drastically changed — people can find out things about your company and products and experiences and ideas and story in a wide variety of ways now, as opposed to simply through the ads you were up-selling them before — and as the funnel changed, the focus really shifted to a good customer experience/interface and simplicity. The pre-eminent example of that is Apple, but places like Google aren’t far behind. The major “chasm” here is that a lot of old-school people, especially old-school marketers, came up in a way where the idea of a strong brand meant way more than the idea of your relationship to customers. Customers remain loyal to brands, especially if the brand standards are strong! Yea. That doesn’t work as much anymore. I mostly wear New Balance sneakers, but I can check about 190 different websites and find a cheaper, more reliable pair of sneakers … and that “strong brand” and “loyalty” is out the window. In a world with so many options and so many deliverables, the companies who “win” are going to be the simplest, easiest-to-use ones. They’ll get the people, they’ll get the customers, they’ll make the money. For an example of this, consider Amazon. The most broadly interesting repercussion here is that we so often tend to overcomplicate work, but if we just focused instead on simplifying our basic idea — essentially, telling our story, you know? — we’d be better off.